As outrage mounts over an unprecedented bank tax in Cyprus, Europe's biggest economies, France and Germany, have put the blame for the bank levy on Cyprus. Banks all over the country, meanwhile, will remain shut pending parliament’s decision. Both France and Germany, along with the European Central Bank (ECB), have hastened to emphasize that they were not behind the decision to impose a tax on savings in Cyprus. A move which has impacted the markets worldwide. A debate in the Cypriot parliament Monday yielded no result on whether the country should approve the controversial levy. Opposition parties are against the move, leaving the government without a majority in the upcoming vote, which has been delayed until Tuesday. 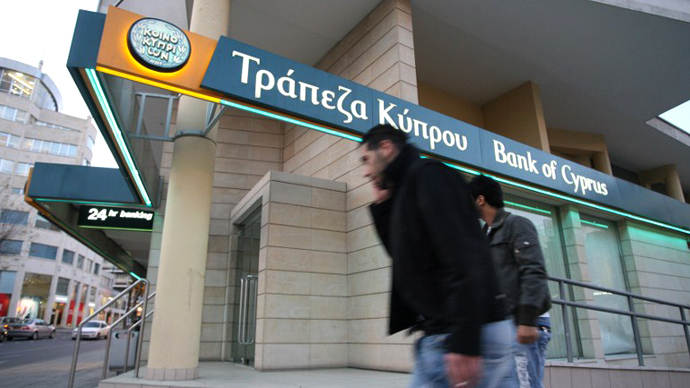 The new tax, which is now being considered by the Cypriot government, would make its citizens shoulder a 12.5-percent crisis tax on savings larger than €100,000, with a tax of 3 percent on smaller deposits. The move comes after European finance ministers demanded Cyprus seize a significant portion of all deposits in the country’s banks in order to secure a €10 billion bailout. And while Cyprus says Brussels gave it no choice but to accept a painful tax on the country’s bank deposits in return for international aid, Germany and France say it’s not their fault. 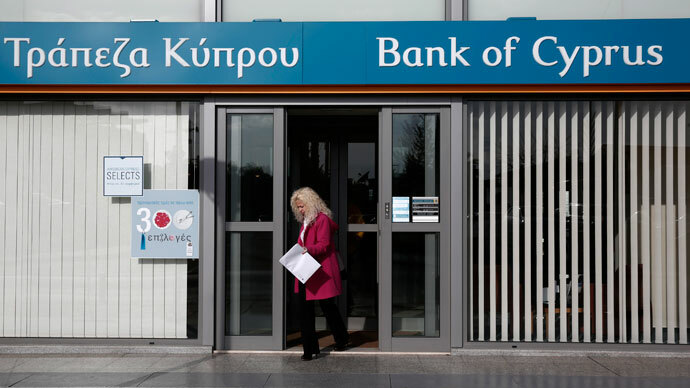 "How the country makes its contribution, how it makes the payments, is up to the Cyprus government," Germany’s government spokesman Steffen Seibert said. "Germany could have imagined a different plan but it is not our decision," he added. Protesters in Cyprus, who gathered outside the Parliament building in the capital Nicosia, to express their outrage over the bailout, have held up banners blaming Germany for the controversial bailout deal. 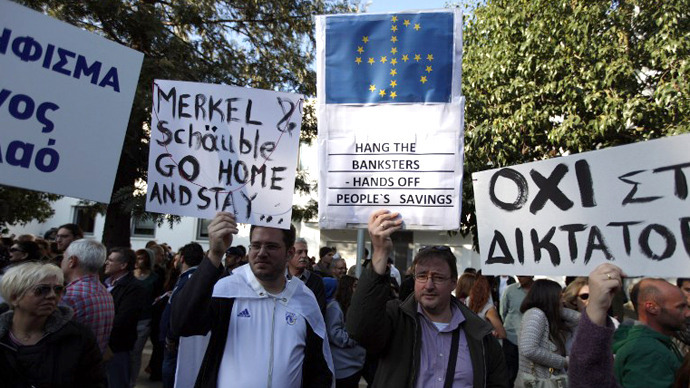 “Merkel, you stole our life savings,” read one of the banners. The other – “Europe is for its people, not for Germany”. The ECB from its side argued that the initiative was “the Cyprus government's adjustment programme, not the Troika's or any other government's,"
"If Cyprus's president wants to change something in the structure of the levy on bank deposits, that's in his hands. He must simply make sure that the financing is intact," ECB executive board member Joerg Asmussen said. France backed Cyprus' “different distribution to better protect small deposits,” saying that its choice “respects the total amount of its contribution to the program, we have to listen to it and, for me, to hear it," France’s Finance Minister Pierre Moscovici told AFP. The ECB opened the door to possible amendments to the EU bailout deal, arguing that as long as the financing was secure, it was up to the Cypriot government to decide how to raise it. In Russia, whose citizens constitute a number of clients of Cyprus’ banks, President Vladimir Putin slammed the proposed tax on bank deposits as "unfair, unprofessional and dangerous." 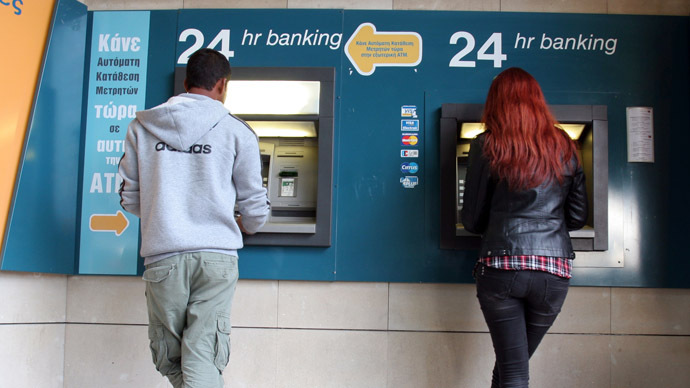 Meanwhile, banks in Cyprus will remain closed on Tuesday and Wednesday until a decision by parliament is made. “A decree will be released shortly from the Finance Ministry to this effect,” Reuters reports, citing a government source.